“God’s Healing for Life’s Losses,” a new GriefShare book from BMH Books by counselor, author, and educator Robert W. Kellemen, Ph.D., LCPC, is now off the press and available for shipping. Subtitled “How to Find Hope When You’re Hurting,” the book provides real, raw, honest and hopeful conversation about suffering, loss and grief from a Christian perspective. The author is a seminary graduate as well as a trained counselor and educator, and the text of this small, gift-sized hardback reflects a solid underpinning of biblical truth and Trinitarian theology to its practical advice and keen insights. The book is endorsed by GriefShare, an organization which conducts Christ-centered grief support groups in thousands of communities. More information about GriefShare is available at GriefShare.org or by calling 800-395-5755. The author, Robert Kellemen, served more than a dozen years as chair of the Master of Arts in Christian Counseling and Discipleship department at Capital Bible Seminary, where he is now professor-at-large. He is a graduate of Grace Theological Seminary, and in his three pastoral ministries, Kellemen has ministered to hundreds of grieving parishioners. He is also founder and CEO of RPM Ministries. 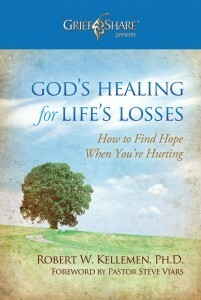 “God’s Healing for Life’s Losses” is available wherever Christian books are sold in stores, online, or through BMH Books at www.bmhbooks.com or by calling (toll-free) 1-800-348-2756. The book’s ISBN number is 978-0-88469-270-6 and it retails for $14.99.